The Trijicon AccuPoint 1-6×24 Riflescope offers more versatility and is a better close-range optic than most of its competitors. It is a versatile optic that is capable of easily transitioning from 1-4 power. At 1 power, this optic functions as a red dot optic for close-range combat. As you begin upping the magnification power, you can engage precisely at long ranges. This optic has an illuminated reticle that is battery free. It uses built-in self-luminous Tritium phosphor lamp and fiber optics to provide illumination. The reticle is bright, but you can reduce its brightness by adjusting a cover over the gold or red illumination absorption point. The Trijicon AccuPoint 1-6×24 Riflescope is made from aircraft-grade aluminum to protect it from all the elements. This optic is, of course, fog proof and shockproof. This is likely to be the best tactical scope for close-combat situations. We rate this model as one of the top best tactical scopes you could buy today thanks to the superior nature of its lenses. Its lenses are multi-coated to ensure better clarity at all times. Coated lenses ensure better light gathering capabilities which means you will have clear, sharp images even in low light conditions. You do not need to use a battery for illumination of this scope. With fiber optic technology, you can automatically adjust its brightness level. 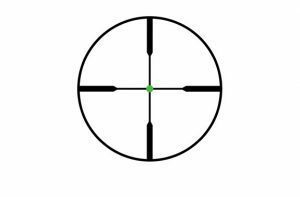 This applies even when setting contrast of the reticle aiming point. This ensures you get better image clarity and focus. It will also save you from worrying about when next to charge your batteries. This model has an aircraft-grade aluminum housing. This is a crucial feature for people looking to have a rugged all-weather construction. This strong and durable housing is meant to keep the model free from rust, corrosion or scratches due to the tough weather elements and harsh nature of hunting environment. The Trijicon AccuPoint 1-6×24 Riflescope features a second focal plane reticles, which is one of the most desired features in most modern riflescopes on the market today. 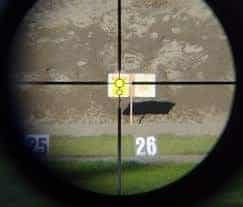 This means that its reticle size will remain constant no matter the change in magnification. This will help you get a precise target even at higher magnifications. The entire Trijicon AccuPoint 1-6×24 Riflescope has a matte black finish that is hard-coat anodized for every MIL-A-8265. According to Trijicon, it is class 2 dull, Type III, and non-reflective. Well, it’s quite hard to understand what all those specifications mean in particular, but it is pretty obvious that it is non-reflective. All its markings are written in slightly dull white color, and the markings are easy to read and show up well; they are not brilliant white. 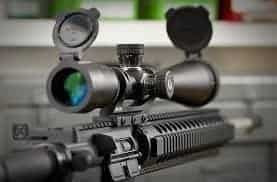 The overall appearance of this scope is tactical in nature and is good looking. With a fast focus eyepiece and complete diopter range that can cover a whole field of view in less than a 360-degree rotation, this scope will provide a quicker aim at your target. The eyepiece has a slight ribbing on it to offer more grip. It is also smooth with good resistance in its entire adjustment range. 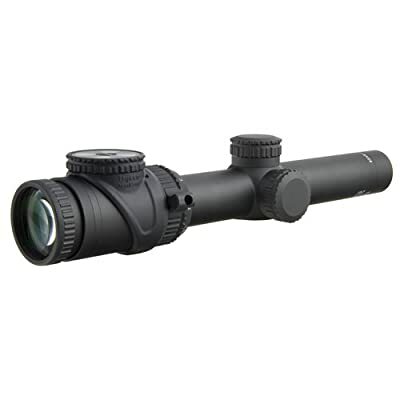 Offering a clear and quick 1X scope with capabilities to go out to 6X, this equipment is the best tactical scope in the market. The Trijicon AccuPoint 1-6×24 Riflescope is made with an aircraft-grade aluminum housing and has an all-weather rugged construction design to protect it against toughest elements. Its battery-free illumination, as well as fiber optic technology, provides automatic adjustments to the brightness level. The contrast of the reticle aiming point to light conditions in your current location enables it to illuminate well even in low-to-no light condition. It has multicoated lenses to offer more light capabilities and greater clarity with zero distortion. 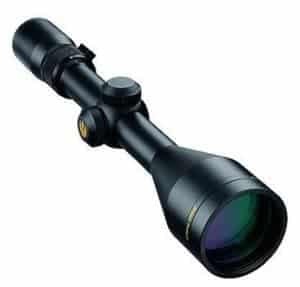 The reticle size remains constant no matter how you increase magnification size thereby providing an exact aiming point even at higher magnifications. For the price, Trijicon AccuPoint 1-6×24 Riflescope will not disappoint; it offers great value for money.